We’re Cynthia Kahn and April Shepherd. We believe so strongly in the way we apply agile that we decided to write a book about how we coach teams to better utilize agile scrum. The overwhelming number of inquiries and positive feedback we received for our GSD Scrum Handbook motivated us to develop a class based on our book. After you read the book, you understand scrum, but you may not know how to take the next steps and get the rest of your organization up to speed. You want your organization to become agile too. We know how much is on the line when you not only have to convert your team to agile, but also plan for and deliver your first agile project. Here’s where GSD Scrum Training can help. We now offer a one-day scrum training program that provides the class instruction and hands on exercises needed to organize, plan, execute and accurately status report progress for your agile project. Let us help you. 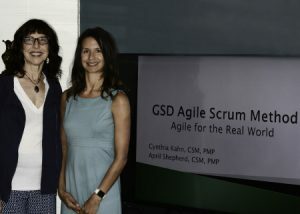 We would love the opportunity to train your development teams in the The GSD Agile Scrum Method, so they too can be more productive. If you haven’t read the GSD Scrum Handbook yet, you definitely need to read it. The handbook is FREE, so you really have no excuse not to read it. Contact Us and we’ll send you a copy.